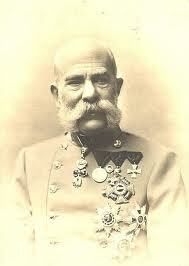 Emperor Franz Josef (1830 - 1916) was part of the reason that the Austro-Hungarian was held together. The Emperor was popular throughout the empire. He could speak almost all of the empire's official languages. He ruled the empire for nearly 68 years. He was 84 when the war started, and died in the middle of the war at the age of 86. He was aged and didn't want war, he only allowed war when his generals and marshals urged him to do so. The Archduke was the son and heir of Emperor Franz Josephs brother Carl Ludwig. He and his wife were shot dead on June 28th of 1914. It was because of this World War 1 started. Austria-Hungary declared war against Serbia and the war began. He was originally the 3rd in line for the throne, but because of the death of the Emperors son (1889), Prince Rudolf and his own father Archduke Charles Louis (1896), he was moved up. 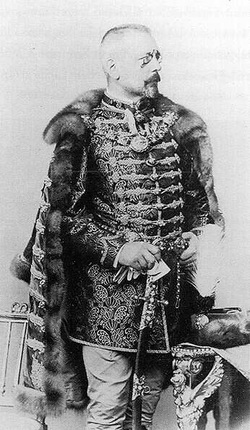 Count von Hötzendorf (1852-1925) was a close friend of Archduke Franz Ferdinand. He became the chief of staff to the Austrian Army in 1906. He favours aggressive foreign policy. He was dismissed when he called for an aggressive attack on Italy in 1911, but was called back in 1914, this time he called for another aggressive attack on Serbia. His campaigns on Russia were unsuccessful and suffered heavy losses. When Karl I became the new emperor, he sacked von Hötzendorf and replaced him with Arz von Straussenberg in March 1917. Von Hötzendorf then commanded the Austrian Army in Italy. After further defeats, he was called back from the front line and retired. The situations on the battlefield and lives of ordinary soldiers eluded him, so his plans for battles "seldom qualified for military realities" and took heavy casualties. However, he contributed a lot to modernise the Austrian Army, including successful attempts on aerial reconnaissance. Leopold Anton Johann Sigismund Joseph Korsinus Ferdinand, Count von Berchtold (1863-1942) was the Foreign Minister of Austria-Hungary when the WW1 broke out. He was reputed to be the richest man in Austria-Hungary. After he joined the diplomatic corps in 1893, he was rapidly promoted. He had served as an ambassador in London, Paris, and Petrograd. He took up the appointment of foreign minister upon his return in 1912. During the Balkan Wars (1912-1913), he was against Serbia. 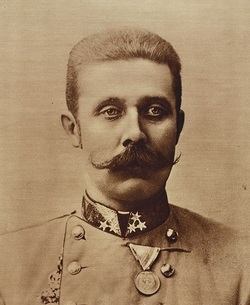 When he saw an opportunity to humiliate Serbia after the assassination of Archduke Ferdinand, he wanted to invade Serbia immediately, but was overridden by the Hungarian Prime Minister Tizsa, who wanted to penalise Serbia diplomatically. He convinced the reluctant Emperor to sign the unacceptable ultimatum for Serbia, telling him that Russia wouldn't help Serbia. When Italy demanded land in Southern Austria, von Berchtold recommended declaring war with Italy, or agree with Italy's command. He was forced to resign in early 1915. He was replaced by Count Burian. He served as the Foreign Minister of Austria-Hungary from 1915, following the forced resignation of Count von Berchtold. From the start he opposed the Germans. Germany wanted to make sure that Italy remain neutral, by persuading Austria-Hungary to give land to Italy. Burian was angry at this and didn't do as Germany asked. He irritated the Germans further by insisting on the Austro-Hungary on the Balkan Front and consistently opposing the unrestricted submarine warfare suggested by the Germans. He did, however, play an important part in bringing Bulgaria into the Central Powers, and improved Austria-Hungary's relationship with the Ottoman Empire. His attempts to make peace with the Entente Power was unsuccessful(he proposed that the Central Powers keep what they conquered in the East, while they give up the land they conquered in the West). He was also forced to resign, like his predecessor. He was succeeded by Count von Czernin. He was called back in 1918, when another attempt was called to make peace with the Entente Powers similar to the one he proposed before. He resigned again after realising the Entente Powers would only recognise an unconditional surrender. He was replaced by Gyula Andrassy.